Every once in a while, a film comes along and just socks you squarely in the gut, causing such a mix of emotions and leaving you utterly breathless. 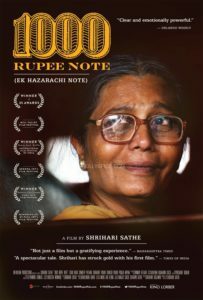 Shrihari Sathe’s 2014 Marathi-language film Ek Hazarachi Note (“Thousand Rupee Note”), which opens this Friday, September 23rd at New York’s Village East Cinema, is such a film. Budhi is a widow who lives in a small village in Maharashtra. Her son, overcome by debts, committed suicide, and her daughter-in-law was taken back by her family, leaving Budhi completely alone. She works as a maid, cleaning and washing clothing, and each day starts with the quest to spend 2 rupees on milk and 2 more on sugar for tea, and then another 2 for rotis to eat with it. Budhi has, however, adopted the family living in the shack next to her own – Sudama, a goat-herder who is like the son she lost, and his wife and children. When they all attend a political rally – everyone in the village is going because they’ve been promised a meal, and that’s something they can’t afford to let pass them by – the politician who comes to make a speech and seek out their votes learns that Budhi’s farmer son committed suicide. It’s a sensitive topic in India, and instead of handing Budhi a 100 rupee note as he’s done to many of the others lined up to meet him, he fumbles in his wallet and thrusts some 1000 rupee notes into her hands. For Budhi, this is almost a dream come true. Sudama advises her to hang onto the money and wait to spend it, but Budhi is anxious to get some things done. She needs to have her glasses fixed so she can see properly. The death portrait of her son is in a broken frame, so she wants to replace it so she can honour him properly. She longs to have a new saree and blouse, and she wants to buy clothing for Sudama and his family. Sudama reluctantly agrees to accompany her to town, where her troubles begin. No one can break the 1000 rupee note she tries to pay with. Finally, at the clothing store, her purchase is large enough to make using the note acceptable, but the merchant is suspicious that the note might be counterfeit. This chain of events results in Budhi and Sudama spending the night in jail. When they are finally released, the policemen keep most of her money, and give her back one of the notes. What Budhi chooses to do with it is heartbreaking. 1000 Rupee Note made me sad. It made me cry. It also made me very, very angry, especially at how Budhi and Sudama – good people, honest people, hard-working and yet poor people – are treated, especially by the police. But the film is also hopeful in many ways. Budhi is a survivor, for worse (how hard it must be without a family of her own) and for better (how lovely is the relationship she shares with her neighbours). Shrihari Sathe’s film is meticulously written and crafted, with so many interesting details. Every performance is terrific, but none better than Usha Naik as Budhi. Naik gives Budhi many shades: we see her mourning the loss of her son; we see her delight in making a cup of tea and chatting with Sudama, giving him advice on how to treat his wife (whom Budhi likes). The only moment she gives in to hopelessness is when she’s tossed into a cell at the police station: and her worry is not for herself, but for the others around her, for whom she feels she must be a jinx. And, yet, despite all of that, there is a core of hopefulness to Budhi, exemplified by the orange ribbon that adorns her hair. Surely someone who takes the time to add a little bit of such a happy colour to herself every morning must have, deep down, faith that everything will turn out all right, and that, ultimately she will be happy? I hope so. I really hope so. 16 queries in 0.355 seconds.